Unveiling Ceremony Saturday October 26th! Details Here! We are currently holding public build sessions at 23-04 Cornaga Avenue off the Beach 25th St A stop. They take place every Saturday, weather permitting, from 12 to 6pm. People ages 16 and up are invited to use tools, and there are arts activities for younger children. Please read more about our build sessions here. You can also get updated information by calling (347) 699-6031. We can't wait to build with you! Hurricane Sandy left a destructive mark on the landscape of the Rockaways, but this project is facilitating community involvement in creating an artwork signifying an affirmative vision for years to come. The sculpture draws on the idea of "prayer trees" found in various cultures around the world. These are trees specially chosen within a village or town where people express their hopes and prayers by affixing scraps of fabric or other objects to the tree. The tree becomes a repository of the hopes and aspirations of the community. The tree also represents rootedness and protection in the face of tribulation. Parts of Rockaway that had trees growing on the coastline were far less damaged by the storm than those without. The hope is that the collaborative process of building the sculpture, as well as the final piece itself, can act as an anchor against the erosion of Rockaway communities by bringing people together and also acting as a reminder of the importance of ecological stewardship. As an assemblage, Sea Song allows for the inclusion of many “voices” in the form of found and hand-made objects contributed by residents impacted by the storm. 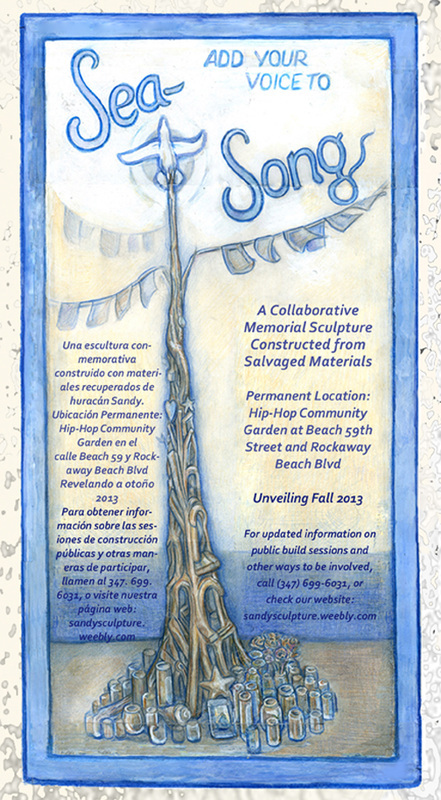 It will have its permanent home in a community garden on Beach 59th Street and Rockaway Beach Boulevard, providing an ongoing locus for gathering and reflection. Standing nearly sixteen feet tall, the tree-like structure will continue to grow as visitors leave messages and mementos around its base and within its varied crevices. This sculpture is being built through collaboration with a number of local groups and initiatives. The unveiling ceremony will include sharing stories about the storm, food, and performances by local artists. We are holding workshops with residents of all ages to create numerous "resilience flags" to be suspended from the top of the piece.